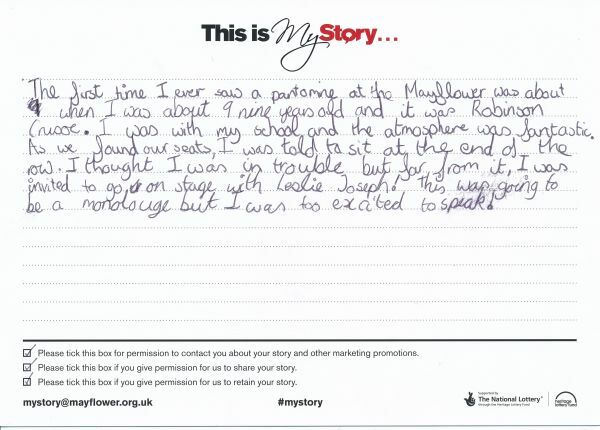 My Story card: Katie Chant remembers seeing a pantomime with her school. The first time I ever saw a pantomime at the Mayflower was when I was about 9 nine years old and it was Robinson Crusoe. I was with my school and the atmosphere was fantastic. As we found our seats, I was told to sit at the end of the row. I thought I was in trouble but far from it, I was invited to go on stage with Leslie Joseph! This was going to be a monolouge but I was too excited to speak!